A young child counts from one to 10 as an oak tree leafs out in the spring and then back down to one again as the leaves fall in autumn. The child, who has light-brown skin and a head of thick, curly black hair, lives in a little purple house next to the tree and is a close observer of all that happens on and around it. 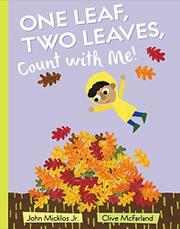 Micklos’ bouncy rhyming verses keep the pages turning as the seasons change and leaves unfurl or fall, numerals sharing the pages with the text to reinforce the counting. “Nine leaves, / ten leaves, / green and young. / Here come / more leaves. / SPRING HAS SPRUNG!” McFarland’s crayon, watercolor, acrylic, and digital illustrations are angular and graphic, blocks of color and simple shapes standing in for flowers, the animals largely abstract, especially the birds. Full- and double-page spreads, vignettes, changes in perspective, and scenes showing the tree as it gains/loses leaves combine with the clues signaling the seasons’ changing and the different animal visitors to keep readers’ interest despite the book’s singular focus. The one quibble is that this is an oak tree. Depending on where readers live, oak leaves may not turn red or orange, and they may not fall in autumn, instead turning brown and hanging on into winter.